This should be subtitled “epic day”. It really has been. Kicked off with a quick circuit of the home patch, and caught BM a juicy Fieldfare in the heligoland. Onwards quickly to see if there was any joy with yesterday’s lost locustella – no – so on to check if the Bluethroat was still around – yes – and then linked up with JLI for an hour before he had to catch the ferry. Some common odds and sods, and then I was going solo. Back to Skaw for a really proper circuit. Masses more Redstart than on any previous day this week, and a noticeable fall of Song Thrush, Whinchat and to a lesser degree Reed Warbler. First good bird of the day (Bluethroat notwithstanding) was a Wryneck that flew past me, and then pitched down onto a drystone dyke. Before leaving Skaw, notched up a Sparrowhawk, and then on to Vevoe for more common migrants and 2 flyover Black-tailed Godwit. Stopped at every garden and crop on my way to Isbister, gradually adding more Lesser Whitethroats, Robins etc. First migrant in Isbister was a Red-backed Shrike beside the road, and shortly afterwards got excellent views of a Grasshopper Warbler as it scurried across short turf and into a cabbage patch. So far, so good, but the rest of Isbister was a bit of a struggle. I went through every iris bed, walked every crop, checked every bush… but really, it was still too exposed to the brisk south-easterly wind and migrants, if there, were mainly keeping their heads well down. Picked up more good indicator species as the day progressed – Goldcrest, Tree Pipits, Yellow Wagtails, Spotted and Pied Flycatchers… Meanwhile JA found a Common Rosefinch and a Red-breasted Flycatcher. JLI returned to the isle, so we hooked up again and twitched JA’s flycatcher. A smart beast, and shortly afterwards we stumbled across another Wryneck – sporting an enormous shiny silver ring on its right leg. Wary, it soon vanished from sight. Shortly before JA’s arrival to see it, we refound it (or another) nearby – never could see the ring on this one, so not sure if it was the same bird. Have to assume it was for accuracy’s sake, though I have my doubts. 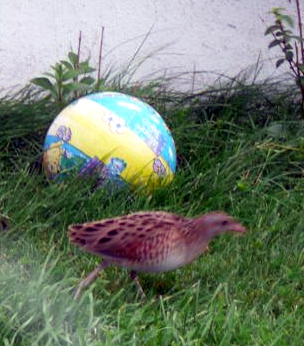 On again, and shortly after we’d left JLI got a phone call – a Corncrake in a walled garden at Vatshoull! We were a minute away from a long-overdue lifer for me… I’ve never been to the Western Isles to see the breeding ones, have never got lucky on migration, and have never been privy to any “undisclosed site” breeders… so this was a big deal. JLI phoned JA to tell him the news – JA meanwhile had found a bunting, which had promptly vanished from right beside him leaving him unable to give it a name. Ooer! Presently JA and BM arrived, and before long we’d all had good views of the crake scurrying to and fro amongst the bushes that lined the wall. Enormously relieved, we then moved on to the quarry where JA had seen his mystery bunting. He’d seen a chunky bunting bill, and a pale-toned back, and was confident it wasn’t a Lapland – but that was all we could go on at this point. We walked into the scrubby area he’d first seen it in, and promptly flushed a bunting. A flash of pale primrose yellow, a hint of wingbars… JLI called it immediately – “I think that’s a Yellow-breasted!”. Unfortunately, we’d none of us seen enough to be absolutely sure. And the bird had flown out of the quarry grounds, and was nowhere to be seen. We tried to relocate it in the surrounding fields for some half an hour, before returning to the quarry, understandably a little tense by now! We walked in more slowly and cautiously than before – and flushed it again, but this time it flew just a few feet before landing on the ground. We took one look, and yes! It was definitely a Yellow-breasted Bunting. Congratulations all round, and a dram afterwards to celebrate. Tomorrow will have to raise its game considerably to better this for a day’s local birding in Shetland!